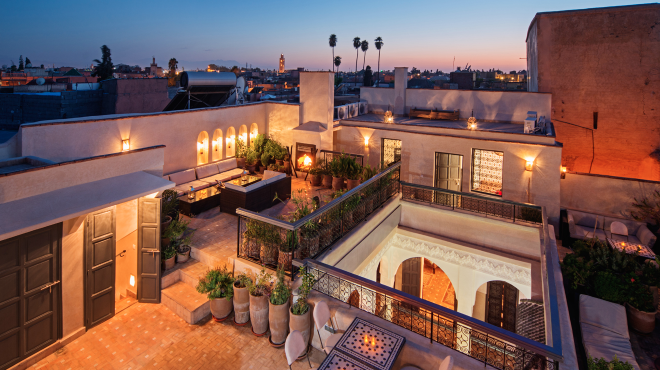 Riad Star is the amazing and newest Riad hotel in the vibrant Marrakech, located in the medina, known to be the one-time residence of Josephine Baker. 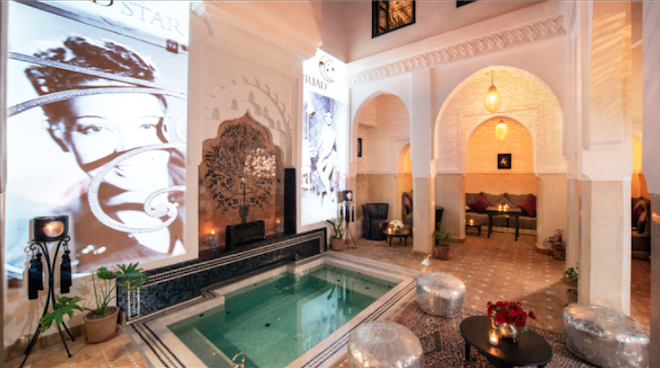 It offers a quite relaxing environment contrasting with the outside busy medina, with very nice and attentive staff, tasteful meals and sunny terrace with a dipping pool fountain. 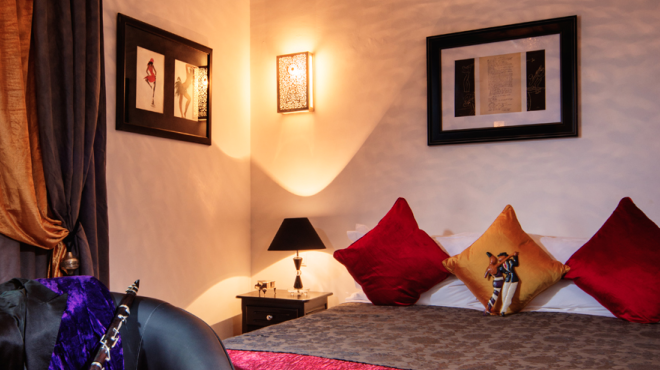 The rooms are classy, gorgeous and well-equipped. 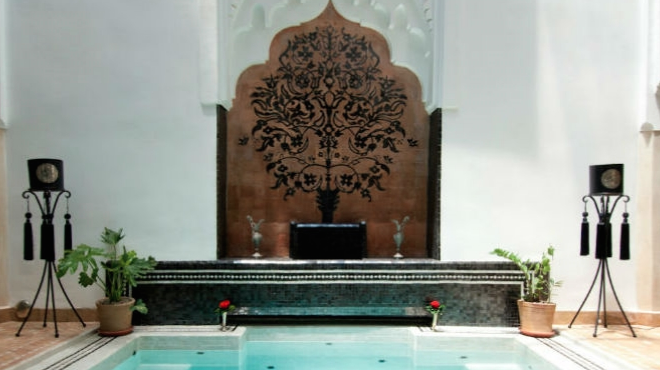 Riad’s hammam and massage suite are another plus. Hotel-mobile phone was offered during my stay in case I get lost in the red city. 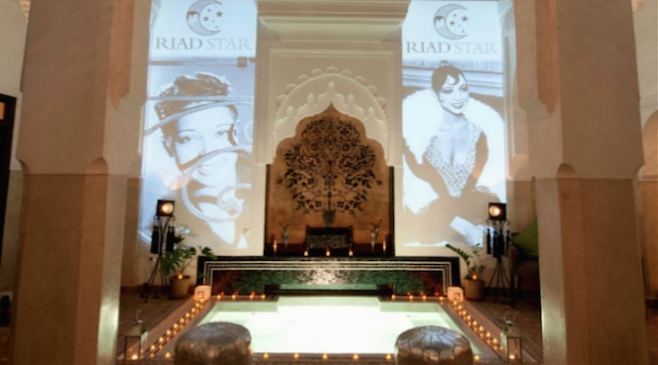 A one-time residence of vaudeville star, actress, hero of the French resistance and civil rights pioneer Josephine Baker, Riad Star is a celebration of the human spirit. 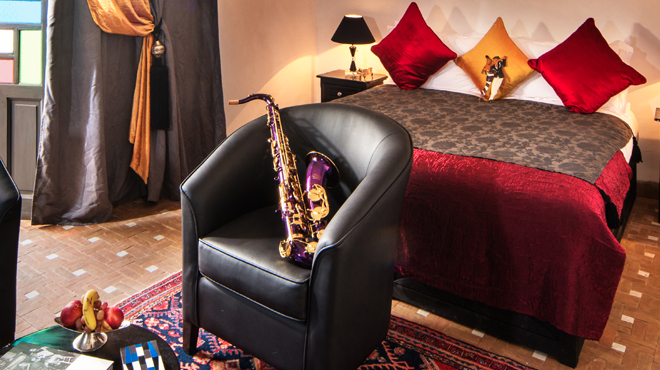 Relax in the Jazz room and enjoy luxurious 300 count Egyptian cotton bed-linen, sumptuous big marshmallow squishy pillows, quality cotton white bathrobes and soft fluffy towels. 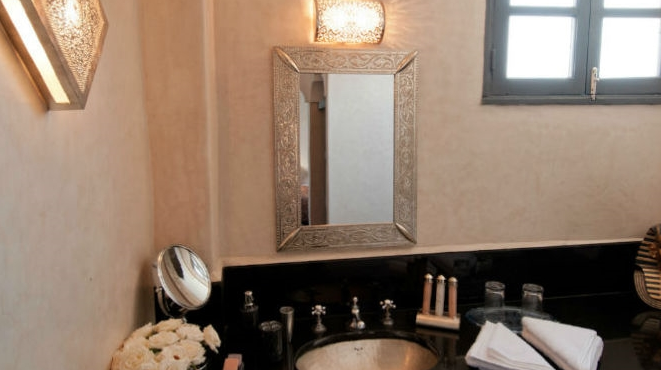 For your convenience there is a mini fridge, a room safe, an ipod dock, wifi and in room satellite tv. 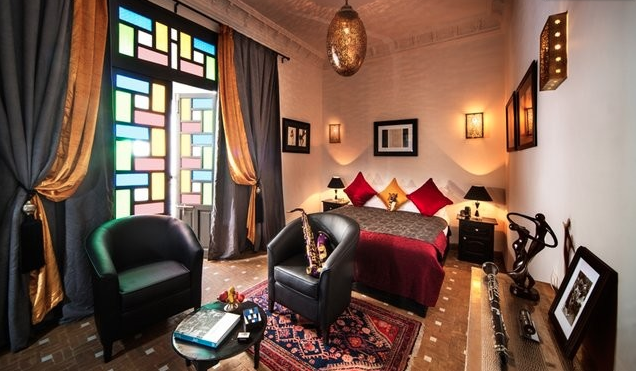 Like the other rooms at Riad Star the Jazz Room can be made up as a Queen sized double (2m by 160cm) or a generous twin. 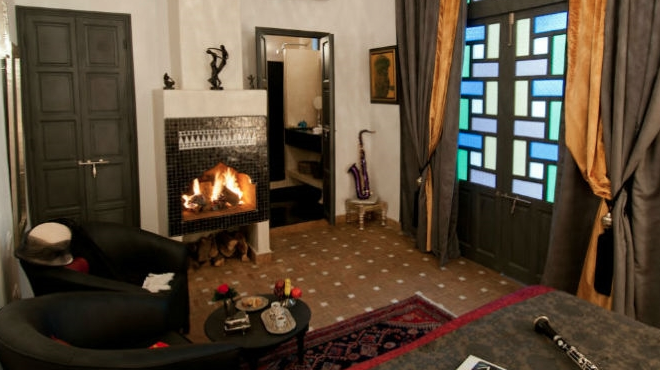 Unusually for Marrakech The Josephine Room at Riad Star has a window onto the street. It is believed the Pashah of Marrakech paid children to sit outside Josephine’s window and read for her while she was convalescing. 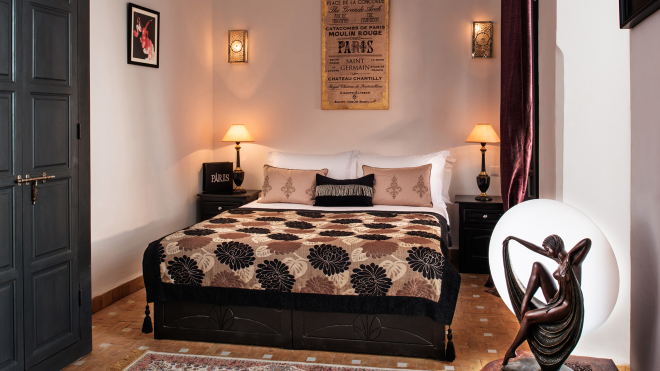 A romantic double or twin (bed 190 by 150cm), with spacious en suite featuring shower and tub. 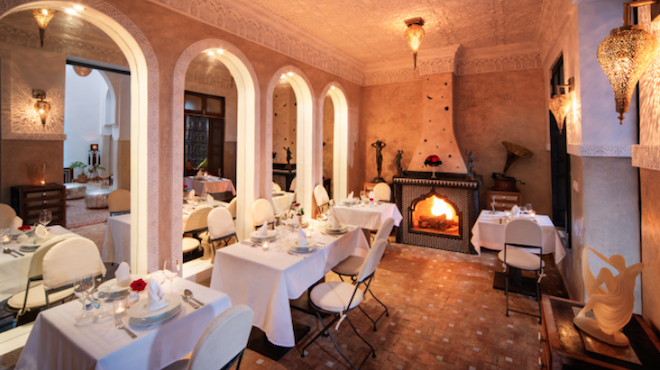 Traditional Moroccan decor with 21st century comforts. Can be interconnecting with the Star Room. 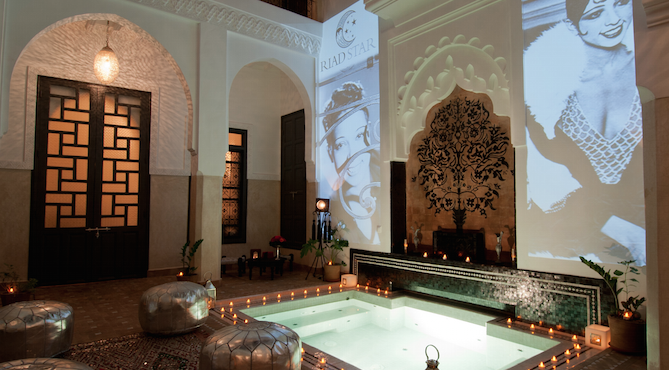 The Star Room is located on the first floor at Riad Star Heavily decorated with stunning hand carved plasterwork this spacious room is truly fit for a Star. 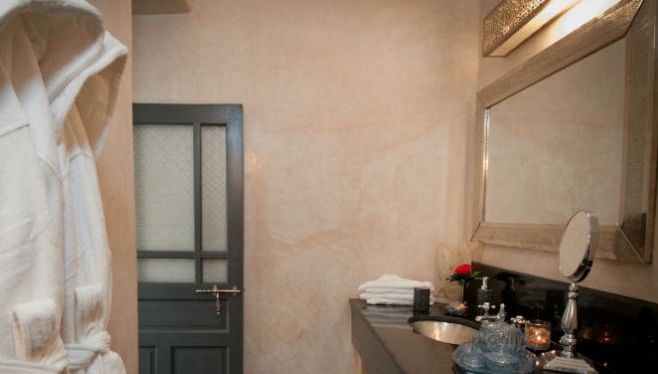 Double windows look into the peaceful Riad courtyard while the en suite shower has a discrete window onto the bustling Marrakech street. 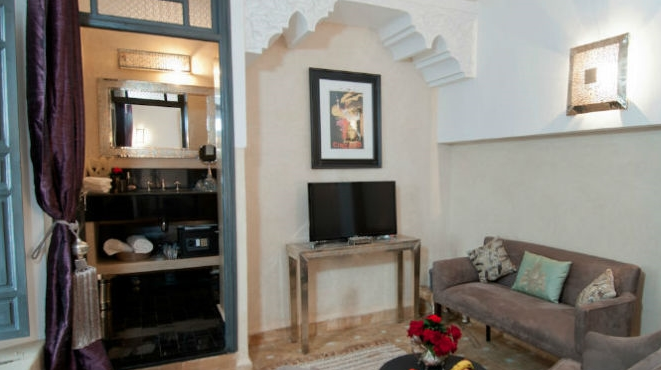 Can be interconnecting with the Josephine room, creating the perfect family suite. 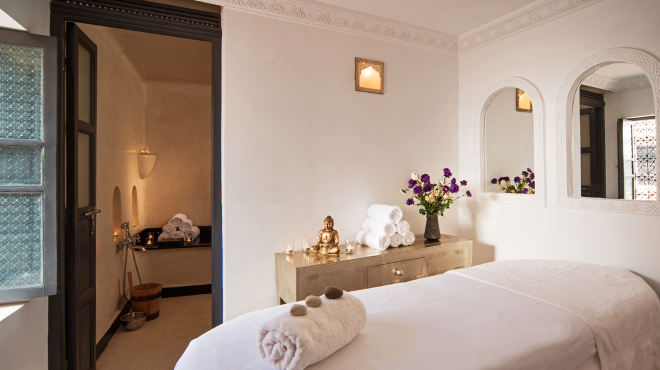 Relax in the Star room and enjoy luxurious 300 count Egyptian cotton bed-linen, sumptuous big marshmallow squishy pillows, quality cotton white bathrobes and soft fluffy towels. 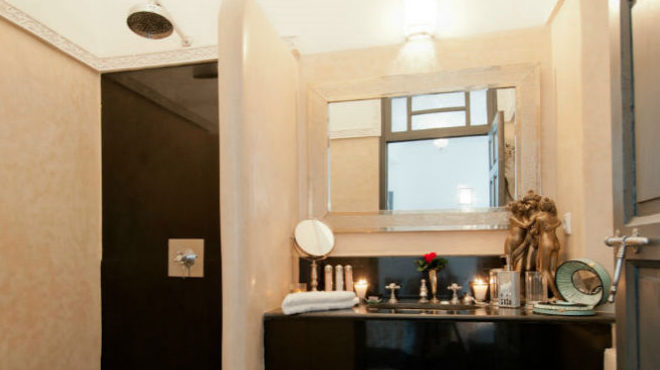 For your convenience there is a mini fridge, a room safe, an ipod dock, wifi and in room satellite tv. 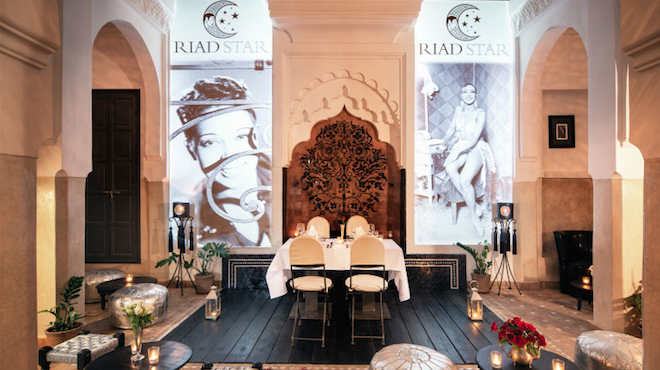 The Paris room at Riad Star is a glamorous room celebrating the golden age of the Casino de Paris Music Hall. 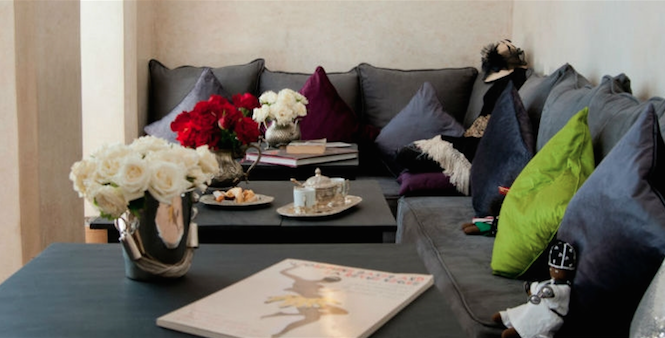 Appealing to the extrovert in all us, the decor includes a stunning red feathered head-dress worn on the Paris stage. 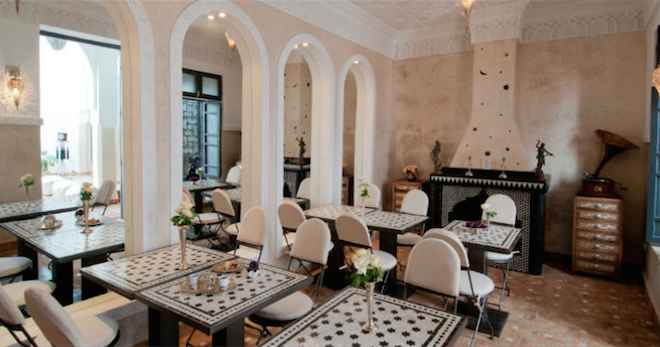 Take in the atmosphere as you enjoy a mint tea in the spacious sitting area. 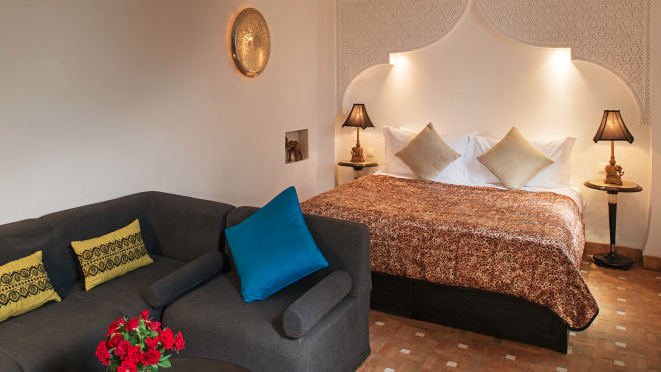 Like the other rooms at Riad Star the Paris Room can be made up as a Queen sized double or a generous twin (bed 2m by 160cm) a further single bed can be provided at an extra charge (£20). 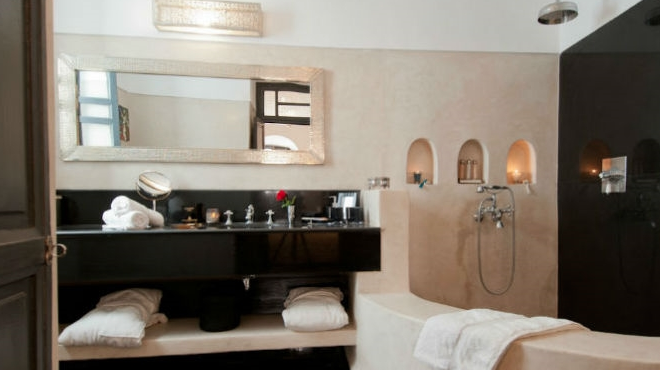 Chiquita room at riad starOur most requested room, the Chiquita room at Riad Star is the only guest room located on the Riad Star roof terrace, near to the Hammam and Massage room. Josephine’s pet Cheetah, Chiquita, famously joined her on stage at the Casino de Paris. 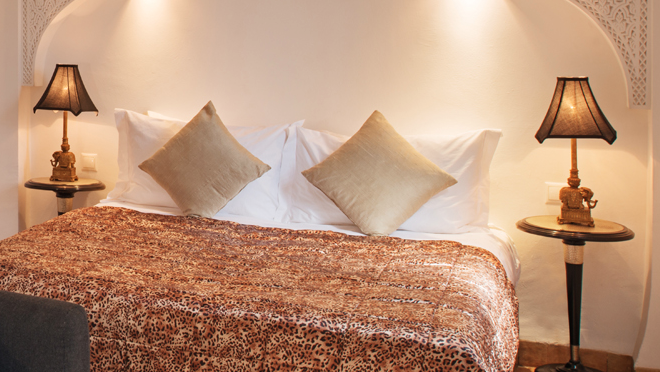 A double or twin room (bed 190 by 160cm) a further single bed can be provided at an extra charge (£20). 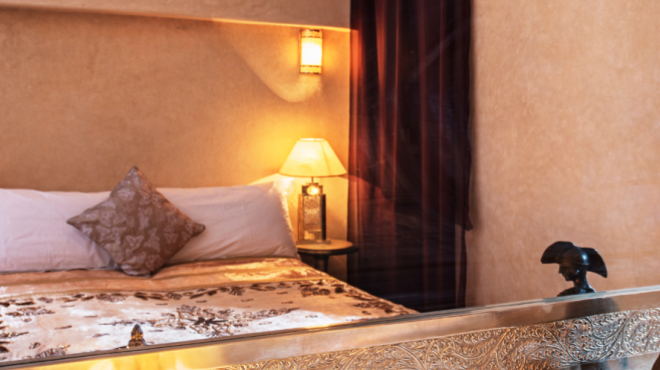 You will love the fireplace and the intricately decorated arch behind the bed. 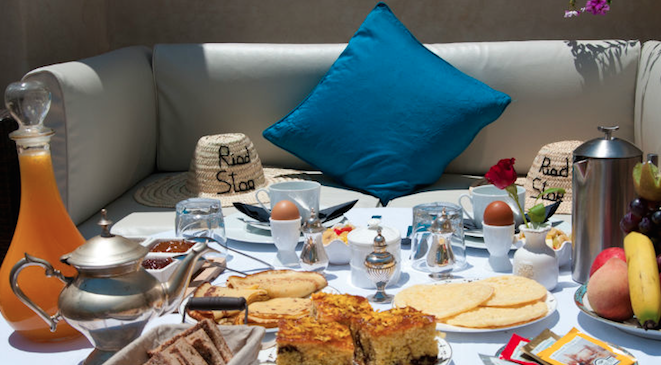 The Rainbow room at Riad Star celebrates tolerance diversity and Josephine’s adopted family of 12 children from different nations. 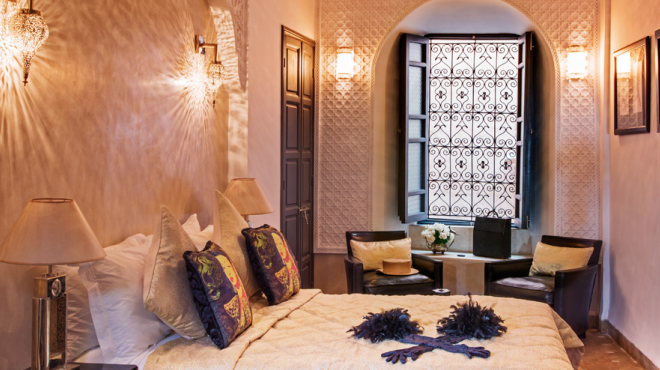 Located in the heart of the Riad its pretty Juliet balcony overlooks the courtyard. 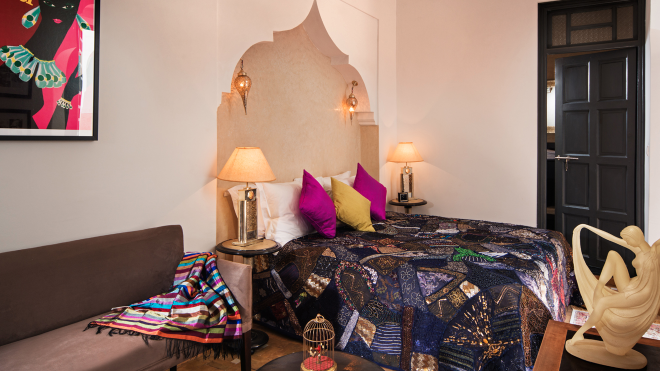 The bed sits inside a sweet Moroccan arch. Double or twin (bed 190 by 160cm). You will love the cheerful colours of the room decor and the quality of light through the antique coloured glass in the feature window. 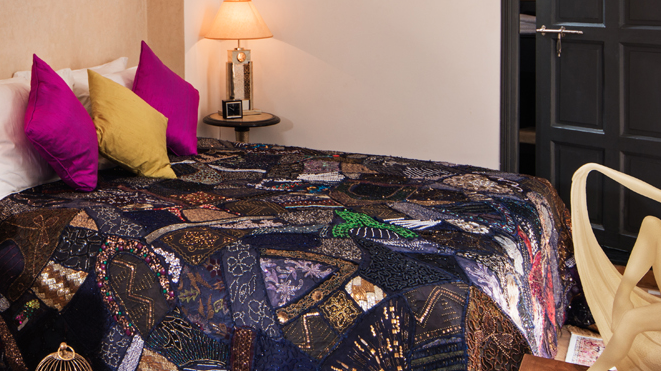 Relax in the Rainbow room and enjoy luxurious 300 count Egyptian cotton bed-linen, sumptuous big marshmallow squishy pillows, quality cotton white bathrobes and soft fluffy towels. 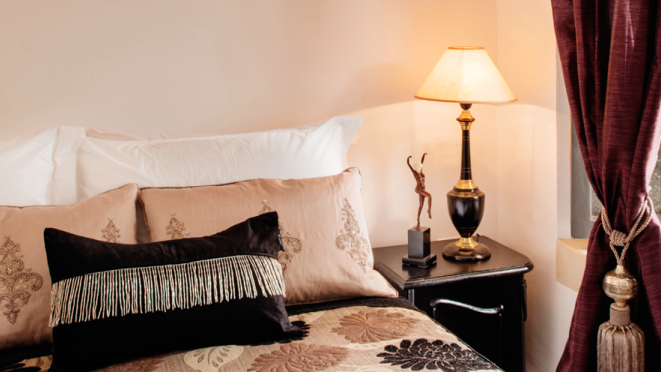 For your convenience there is a mini fridge, a room safe, an ipod dock, wifi and in room satellite tv. 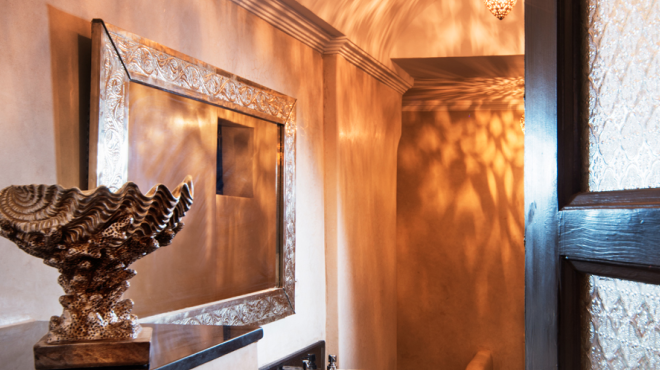 The Charleston room transports you back to the roaring twenties. 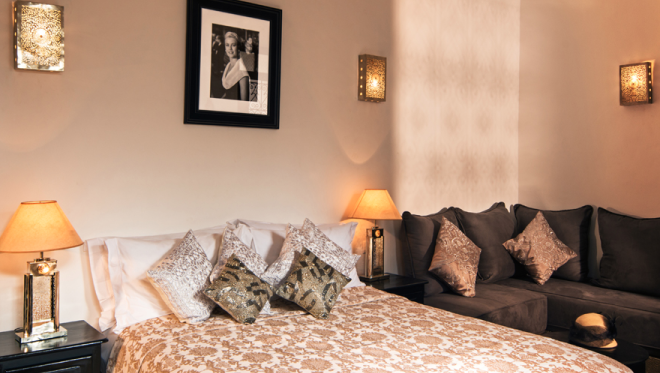 With separate sleeping area and sitting room this elegant mini suite is located on the ground floor patio, near the dipping pool. 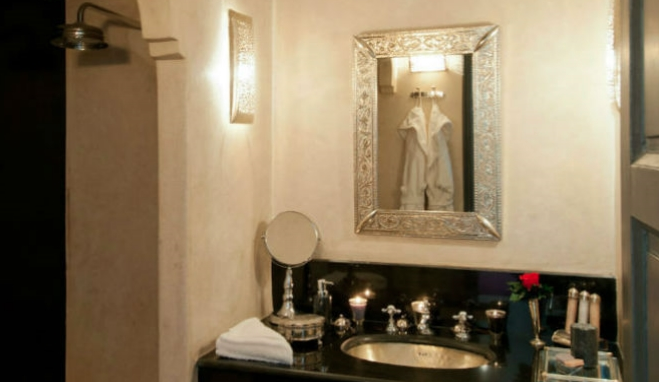 The upbeat decor is evocative of the Jazz age with hand made tasselled lampshades and a vintage statue of a flapper in full flow.Charleston room at riad Star, Marrakech Like the other rooms at Riad Star the Charleston Room can be made up as a Queen sized double or a generous twin. The sofa can be made as a third bed at an extra charge (£20).